What is it that everyone is loving about our Gable Front Conservatory? That is a very good observation Huffyboy! CR Smith, "creating a seaside feel in your own backyard". Its quite catchy isn't it! Love the double hip. Glass roof. Solid end wall. I feel that the corner suite is too big for the room. Choose a cornerTo make your glass extension feel comfortable, install a corner sofa that fits the dimensions of the space, as seen here. 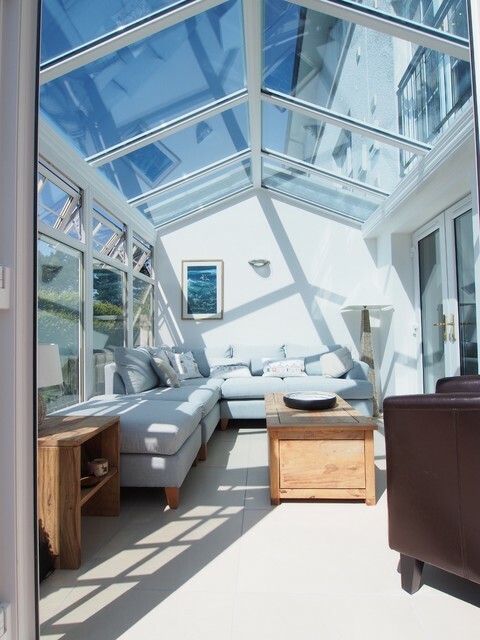 A corner sofa can make a conservatory feel more contemporary, and a modern extension more inviting. It means you can stretch out and relax on sunny or cloudy days. Add a coffee table to further define the space.